For a symptom of Pakistan’s problems, consider the spread of poliomyelitis. This week brought the 115th confirmed case of polio, a crippling and at times fatal disease passed on virally, mainly through bad hygiene. The tally is well up on last year. In most countries polio is barely a memory. Rich countries had largely eliminated it by the 1970s, and many poor countries soon followed suit. 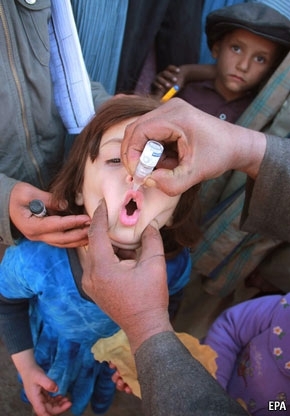 Three decades ago the world saw an estimated 400,000 polio cases a year. Thanks to a cheap and effective vaccine, administered by two drops into a child’s mouth and washed down with dollops of public and private money, the annual global number is now roughly 1,000. Only in South Asia and Nigeria is it still endemic, though it occasionally flares elsewhere. Since even wretched countries such as Sudan and Myanmar are rid of polio, doctors dream it could follow smallpox and rinderpest to become the third disease wiped from the planet. For hope, look at India. Last year it had just 44 cases of polio, down from an estimated 250,000 three decades ago. Sarah Crowe, of UNICEF in Delhi, credits “one of the biggest mass mobilisations ever for public health”. This year teams of workers headed to train stations, schools and villages, mostly in Bihar and Uttar Pradesh, dosing children with vaccines and promoting habits like soapy hand-washing. Pitiful levels of sanitation persist: fewer Indians (about 50%) have toilets than have mobile phones. But this health campaign is working. By contrast Pakistan flounders, even though the president, Asif Zardari, declared a national polio emergency in January and received help from the United Nations and the Gates Foundation. “Definitely the cases are on the rise”, says a glum Dr Altaf Bosan, who heads the government campaign. Blame insecurity most. Three-quarters of last year’s cases were in conflict-ridden areas. The ignorance of religious leaders does not help, with their suspicion of foreign ways. Nor does poor government management. The World Health Organisation thinks that over 200,000 Pakistani children missed their polio vaccinations in the past couple of years. The worst-affected spots are Baluchistan, beset by sectarian massacres and police killings, and the unstable Federally Administered Tribal Areas near the Afghan border. 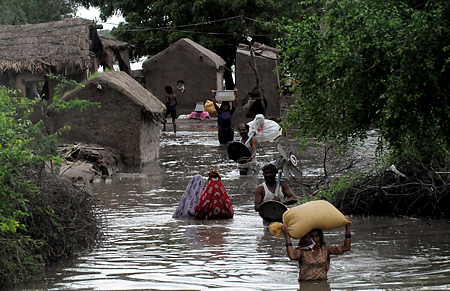 Southern Sindh, deluged by two years of floods, has also been hit. As more people migrate—because of violence, floods or economic need—the virus has travelled north, to Khyber Pakhtunkhwa, Gilgit-Baltistan and beyond. Ten polio cases reported last month in the Chinese region of Xinjiang, which borders Pakistan, were the first in China since 1999. Eastern Afghanistan also struggles with eradication, given insecurity and its porous borders. But the heart of the problem is Pakistan. Officials conceded in January that the country could be “the last remaining reservoir of endemic poliovirus transmission in the world, and the only remaining threat to achieving global polio eradication.” That is no distinction to savour. These days when it rains in South Asia, it doesn’t just pour — it floods. A month of monsoon squalls has deluged hundreds of towns and villages in northwest India and Pakistan. The latter has seen the most acute flooding, and, on all evidence, has been the least prepared for it. At least 233 people have already died and 300,000 are now stranded or in makeshift camps — a figure that will surely grow. Officials in Pakistan claim some 5.5 million people so far have been affected by rising waters. That’s still only a fraction of the 20 million hit by last year’s catastrophic rains, but the forecast looks ominous. There is an urgent need to provide immediate and life saving relief to the millions affected. It hasn’t stopped raining in Sindh for the last 10 days. Large swathes of land are underwater and people are desperately awaiting relief. They have lost their crops, homes and livestock for the second time – and been pushed from last year’s disaster to this one. Sindh, the vast, fertile province abutting the Arabian Sea, appears the worst affected. Across Pakistan, some 900 villages have been wholly submerged and millions of hectares of arable land — some still irrevocably damaged by last year’s floods — are under water. What’s most depressing about the situation now is how keenly it echoes the 2010 calamity. Omar Waraich, TIME’s Islamabad correspondent, wrote this excellent piece a year ago for the magazine’s international editions. As the waters rise, Pakistan faces a familiar cocktail of maladies from last summer. Then, the civilian government headed by the unpopular President Asif Zardari was hampered by political infighting and its fundamental subservience to the real power of Pakistan’s influential military. 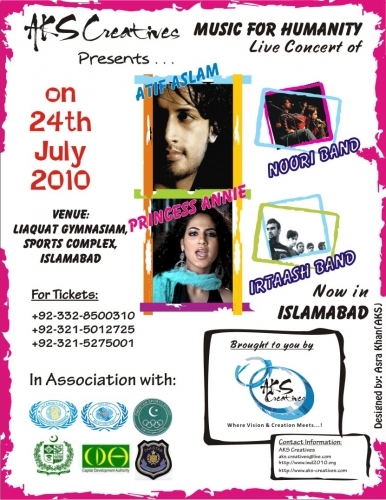 Now, not much has changed (though Zardari is still in his position, a surprise to some). Then, militants and terrorists were exposing the fragility of the Pakistani state with cold-blooded strikes on some of country’s major cities. 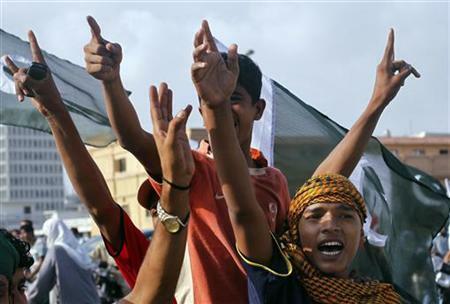 Now, after a rancorous summer of barb-flinging with the U.S., not much has changed either — not least when suspected al-Qaeda allied militants raided a prominent naval base in Karachi earlier this year. Then, the cash-strapped government pleaded for foreign assistance. Now similar calls are being issued, with similar notes of desperation. In the weeks to come, inquests will be made into whether enough had been done to shore up riverbanks, provide shelter and food for the hundreds of thousands left destitute for over a year, and prepare for the next season’s rains. Already, there are reports of angry civilians blockading roads — like last year — demanding outside intervention and aid. Cities like Karachi, which this summer has seen a spasm of internecine blood-letting, will be further strained by refugees fleeing the countryside. On many levels, though, the disaster is not man-made. The floodplain of the great Indus river, home to over 100 million people, birthed one of the world’s first ancient civilizations. But the river likely also swallowed it up. Because of its own particular ecology, the Indus can’t be controlled by similar mechanisms of levees prevalent in the West. And climate change has made weather patterns more unpredictable and volatile. This BBC story from a year ago cites the research of an Indian scientist: Professor Rajiv Sinha, from the Indian Institute of Technology in Kanpur, who has had first hand experience of Asian river floods, takes a more strident position. “What all the climate models predict is that the distribution of monsoon rains will become more uneven in the future,” he told BBC News. In August 2010, more than half of the normal monsoon rain fell in only one week. Typically it is spread over three months. So, if the unusually intense 2010 monsoon is the shape of things to come – and that is uncertain – the future may hold more flood misery for the people of Pakistan. It’s a closing sentence that has proven sadly prophetic. Pakistan called Friday for President Barack Obama to intervene in its longstanding dispute with India over the Himalayan region of Kashmir, the cause of two of the three wars the nuclear-armed rivals have fought. Pakistani Foreign Minister Shah Mahmood Qureshi made the unusually blunt appeal for Obama to seek a resolution of the dispute when he visits India next month, saying he should “redeem the pledge” he made as a candidate. The conflict over Kashmir has been the main source of friction between India and Pakistan since they won independence from Britain in 1947. Pakistan has frequently sought outside intervention to resolve it but India vehemently opposes such involvement and the United States has traditionally stayed above the fray. Qureshi, speaking next to Secretary of State Hillary Rodham Clinton at the closing day of three days of U.S.-Pakistan talks, said Obama must get involved because a crackdown against suspected Muslim militants in Indian-controlled Kashmir threatens the entire region. As a presidential candidate in 2008, Obama suggested that the U.S. should encourage India and Pakistan to resolve the Kashmir dispute so Pakistan could better focus on fighting extremists on its own territory and Afghanistan. Although he did not advocate direct mediation, his comments were met with disdain in India. Obama will not visit Pakistan on his upcoming trip but he plans to spend several days in India, which has cracked down on violent anti-Indian protests in Kashmir since June. The violence has killed at least 111 people, mostly teenage boys and young men in their 20s. Authorities have imposed off-and-on curfews in an attempt to halt the unrest. Quershi expressed astonishment that the U.S. and other major powers had said little about India’s response to the protests. 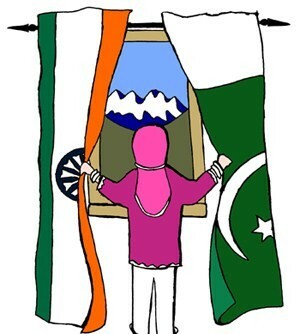 India and Pakistan fought two wars for control of Muslim-majority Kashmir, where rebels have sought independence from India or incorportation with neighboring Pakistan. More than 68,000 people, most of them civilians, have been killed in Kashmir since fighting began in earnest in 1989. 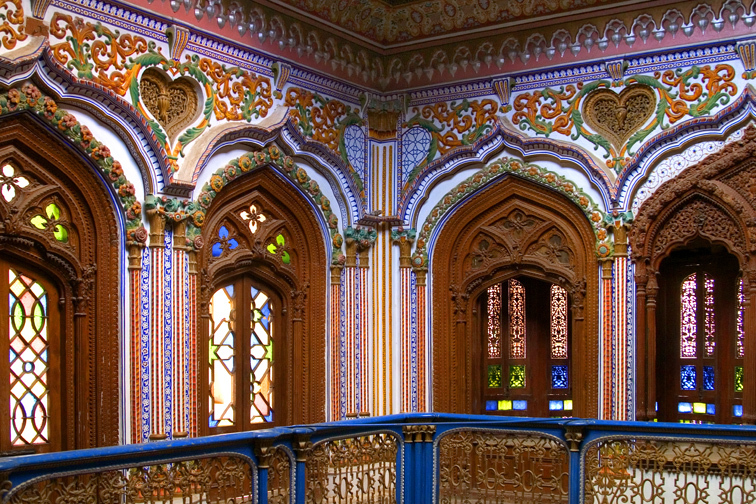 Chiniot – the name is enough to start the furniture lovers, travelers and cautiously curious dreaming. Antiquity is the first message of the town. And, international quality furniture “made in Chiniot” is collectors delight with potentials for marketing all over the world. On the bank of River Chenab in area called Sandal Bar, Chiniot town is an exotic place in the foot of series of hillocks that seem to be man made rather than evidence of old mountains. The town is very ancient. It was inhabited before the time when Alexander of Macedon came in the South Asia and was principal city during the rule of White Huns. Chinese explorer Hiuen Tsiang visited it. Alberuni has mentioned in Kitabul-Hind that Chiniot was one of the there most important places in this part of the world. Chiniot suffered much from the Durrani inroads during the last half of the eighteenth century and also during the troubles of I848 because it remained the scene of constant fierce struggle among the leaders of local factions. As per the local legend, portion of the wall, surviving in situ, had been built during Hellenic period. The veracity of the wall’s association with Alexander the great is yet to be proven though. But the sit does give evidence of its distant past. During the Mughal era, Chiniot produced many intelligent personalities and talented artisans who occupied positions in the Mughal courts, Nawab Saad Ullah Khan and Nawab Wazir Khan held the post of Prime Minister of India and the Governor of Lahore respectively during the rule of King Shah Jehan. 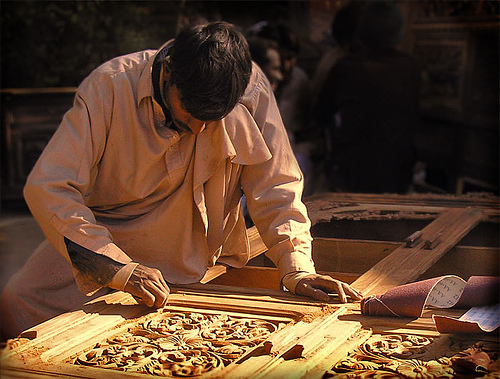 Artisans of Chiniot have instinctive good taste and they have achieved a distinctive excellence in woodwork. Masons of the town are said to have been employed during the construction of Taj Mahal at Agra and Golden Temple at Amritsar. Special type of furniture with brightly lacquered woodcarving is made in Chiniot and is famous all over the world. What this internationally acclaimed craft of the town needs is an institutional patronization and extensive efforts for international marketing? Made in Chiniot furniture is already being shipped to different countries but so far there are very little marketing efforts being made for this purpose. It can be a potent source of earning foreign exchange if attention is paid to and earnest efforts are made. Sadly, the trained incompetents responsible for export promotion do not see this and the unique potentials are not being taped yet. The first exhibition of Chinioti furniture in Islamabad last year was attended by large number of people from all walks of life. Particularly foreigners appreciated the furniture for its style, solidity and the cost. Another such building is the Umar Hayat Palace commonly known as the Gulzar Mahal. Attracting local and foreign tourist, it is known for its beauty and legendary tales attached to it. The palace is said to have been built by Sheikh Umar Hayat, a rich merchant whose family originally migrated to Chiniot from India. Legend has it that in a village fair at Panda Haitian, Umar Hayat fell in love with a performer girl and married. She bore him a son and a daughter. Umar Hayat grew particularly fond of his son whom he named Gulzar – a rose garden or a sign of happiness. It was for his son that Umar Hayat decided to construct a wonderful palace and name after him. Umar Hayat could not see the palace completed and later his son Gulzar died mysteriously in the palace in the early hours of his marriage night. 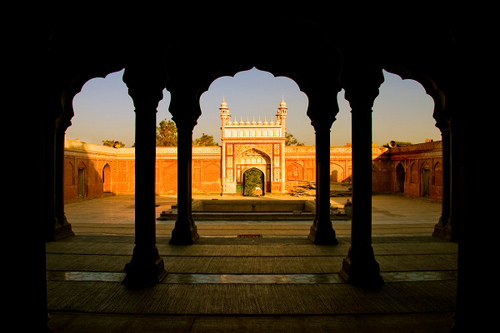 A different tale reveals that the construction of the palace was a result of rivalry between Umar Hayat and Elahi Baksh – a famous artisan of the time. The latter taunted the Umar Hayat by saying that his artistic abilities were superior to all the wealth in the world. Infuriated, Umar Hayat counter claimed that his money would last long enough to buy all the possible feats skilled artisans could offer.